↑ "Drug Enforcement Administration: Drug Abuse Prevention Service Award" (PDF). Learning for Life. Retrieved 2007-12-13. ↑ "1999-2003". DEA. Retrieved 2007-06-03. ↑ "DEA Office Locations". 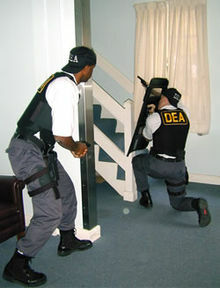 DEA. Retrieved 2008-07-09. Results of Prohibition The financial costs of drug use and drug prohibition in the U.S., impact on levels of drug use and prices. "98 Percent Of All Domestically Eradicated Marijuana Is "Ditchweed," DEA Admits". NORML News Archive. 7 September 2006. Retrieved 2007-03-27. This page was last changed on 1 January 2018, at 05:03.